You are here: Home / Investors / Stock Analysts / SkyWest Inks 3-Year Tentative Labor Deal: What Lies Ahead? SkyWest Inks 3-Year Tentative Labor Deal: What Lies Ahead? SkyWest, Inc. SKYW received encouraging news on the labor front when its subsidiary —ExpressJet Airlines — inked a tentative deal with the Air Line Pilots Association (“ALPA”), the largest airline pilot union across the globe. Notably, this three-year provisional agreement with ALPA is regarding increased wages, improved working conditions and other benefits for the pilots of ExpressJet Airlines represented by the union. Currently, pilots at ExpressJet Airlines function under a concessionary contract that was inked in 2004. They have been looking for a more favorable deal for quite some and have been negotiating with the company in this regard since 2010. However, there is still some way to go before the new contract becomes effective. We note that tentative agreements do not necessarily mean that the deal will be operational. The provisional deal inked by SkyWest’s subsidiary will be voted upon by union members from Sep 13. It will be effective only if the voting result is favorable. The company would be hoping for favorable outcome as satisfied labor groups generally imply greater operational efficiency. 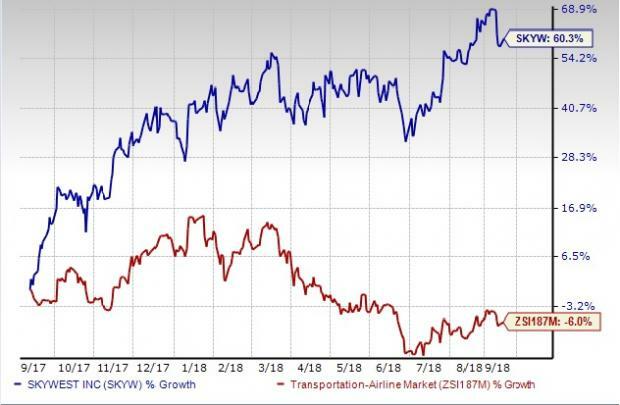 We observe that shares of SkyWest have outperformed the industry in a year's time. The stock has surged 60.3% against its industry’s 6% decline. We expect the provisional deal, on successful ratification, to boost the stock further. Naturally we expect investors will keenly await further updates on this burning issue. Shares of Trinity, Landstar System and ArcBest have rallied more than 37%, 71% and 34%, respectively, in a year’s time.